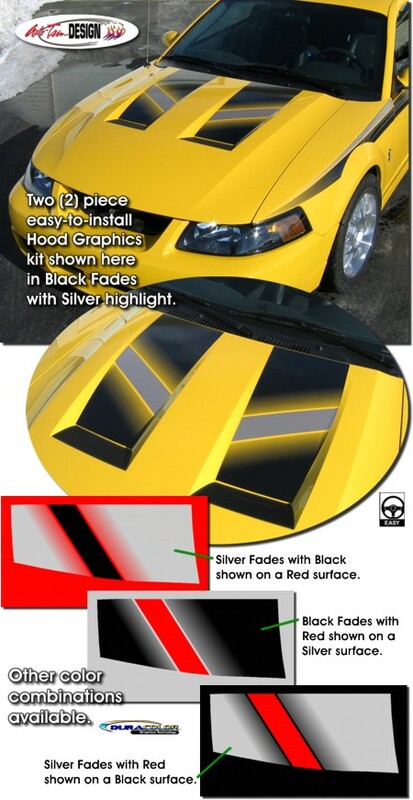 Enhance your '03-'04 Ford Cobra's hood with this awesome looking two (2) color Hood Graphics kit. These graphics are contoured to the inner Hood Vent lines of the Cobra's factory hood as shown. They're precut and ready to install - NO TRIMMING required! Kit is available in one of four (4) color combinations. Graphic pieces are covered with a 2.5 mil clear laminate which will protect the graphics from miles of abuse. Each Hood Graphic measures 11.828"x 27.931" (30.04cm x 70.94cm).